Technology: Open Molding Services are plastic composite molding services which use one-sided molds and resin infused glass cloth, carbon fiber, etc. 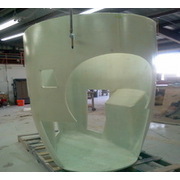 This process is frequently used for making fiberglass composites such as boat hulls, bathtubs, truck cabs, etc. Open molding is a low volume production process. It is a pressure-less process unlike resin transfer molding, requiring hand rolling and brushing of the fiber cloth, mat, and/or strands into the mold. Since most open molding is labor intensive it does not really lend itself to high volume production. However, there is virtually no upper limit to how big a part can be molded as there is with other more automated processes. Open molding uses male or female molds. The process begins with coating the mold with a release agent after which gelcoat is often applied to furnish smooth, shiny outer surfaces. The layers of cloth, mat, or strands are hand laid or sprayed into the mold with a mixture of resin. After curing, the molded part is removed from the mold and finished. Filament winding is similar except it uses a male mold, or mandrel, onto which winds a continuous length of glass or carbon fiber thread.